The deck above is built of AZEK XLM in Sandridge, with TimberTech RadianceRail and Deckorator balusters. AZEK is a low maintenance decking material. The XLM board is made of solid PVC and carries a 25 yr stain warranty. 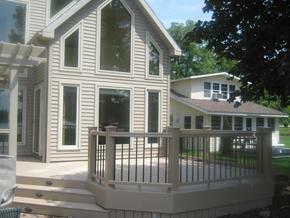 Low maintenance decks (synthetic decks) are very popular in the Fort Wayne and Northeastern Indiana market. The deck above is really one of our signature decks – synthetic PVC deck and railing using AZEK Morado decking and AZEK railing. 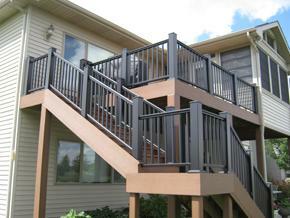 The dark decking and railing colors have become very popular. To see more composite deck pictures from AZEK, TimberTech and Trex, take a look at our composite deck picture gallery on this site. Also take a look at some of our wood decks on our wood deck photo gallery. Archadeck of Northeastern Indiana delivers the service and community commitment of a local, family-owned business backed by the strength of a company that has built 100,000 incredible outdoor structures since 1980. We offer you the benefit of an architectural design center that will custom design your project to complement your home, suit your personal tastes and meet your exact needs for functionality. We invite you to call (260) 969-8663 for a free design consultation (and/or a free deck safety inspection if you happen to own an existing deck). At your consultation we will show you past projects, discuss your needs and desires, explain your construction material options (including low-maintenance wood alternatives), define budget parameters, and measure and photograph your home/lot. The design consultation is completely free and you are under no obligation to hire Archadeck. However, should you decide to move forward after your free design consultation, we will custom design your building plan. You will still not be under any obligation to hire us as your builder until you approve your plan and sign your contract. If you do sign that contract, you will be protected by two separate guarantees, constituting the most expansive customer protection plan in the industry, and local oversight assures your property and privacy are respected. We attend to every detail from securing any needed building permits to final cleanup. And we work very hard to be as unobtrusive as possible during the entire construction phase. Thank you for visiting the Archadeck of Northeastern Indiana web site as you consider your new custom built deck, pergola, screened porch, open porch or gazebo. The site is designed to provide you with a good understanding of the Archadeck experience and the Archadeck difference…..
…..and thank you for considering Archadeck for your project. You can trust Archadeck of Northeastern Indiana to design and build a custom outdoor living space to enhance your life at home, right here in northeast Indiana. We look forward to hearing from you soon. Please use the contact form in the upper right hand side of the screen or, call us today at 260/969-8663 to get started. We build decks, sunrooms, screened porches, pool decks, spa decks, gazebos, pergolas, porches, loggias, arbors, privacy screens, planters, benches, ramps, bridges, walkways, docks, garden structures, outdoor kitchens, outdoor rooms, and much more. We serve Fort Wayne and the 9 surrounding counties, including the Angola and Syracuse Lake areas and golf communities such as Cherry Hill, Sycamore Hills, Autumn Ridge, Glendarin, and Chestnut Hills. Archadeck built our small wooden front deck. Barons team could be compared to the TV show “Treehouse Masters”. Wow is the only word to describe our deck. Being on the deck is so serene and peaceful. If you want quality for your deck, Archadeck is your company. Call for your free wooden deck design today.. Under your guidance my home is made brand new, architecturally more dramatic, cohesive and spectacular in appearance, the perfect bridge between indoor and outdoor, and will be more comfortable for me to live in for a long time. Building this bridge between the inside and the outside in such a grand manner and design has exceeded my expectations already in more ways than I anticipated. My world is expanded greatly to include more of the outdoor amenities, day or night, in a seamless way. Very natural and inviting, even at five in the morning. It was expressly peaceful. I feel like a new person in an enlarged new world that I am eager to fully explore with others in comfort. Baron Biedenweg of Archadeck gave us outstanding service. he personally inspected the finished product to make sure it was done to our complete satisfaction. And it was! We are totally pleased with the product and the service. We like the fact that we no longer have to paint and maintain our deck railing. We could not be more pleased with our new decks. The process was almost painless and we got exactly what we expected. They went above and beyond. Love it! Great attention paid to even the littlest of details. Everything was completed as promised. There were no surprises other than it was completed faster than we expected. The crew even returned to repair patio bricks made uneven by heavy equipment, and we did not have to ask them to. We couldn’t be more pleased. Love the design and look. Very Pleased! Ours was a small job, but it was handled with care and expertise. Would recommend Baron and Archadeck highly. Overall we are very satisfied with our new porch, however there were some scheduling issues which delayed the project a bit and the amount of shade shown in the drawing did not match what we really got. Quality of work and professionalism were excellent. Would recommend Archadeck highly. Did everything they promised, when they promised it. We will recommend you to anyone, anytime. You delivered exactly what was promised and more. Your crew was great to work with. Would definitely recommend Archadeck to others. Very pleased! We love our new deck. The crew was very respectful and professional in their dealings with us. Well done. developed just what we wanted and his crew executed to plan. The highest marks! We are very happy with the special columns. Some of the boards developed large cracks and they replaced them without hassle….refreshing. Overall, they worked very hard to get the job completed in time for our daughter’s birthday party. We are pleased to recommend Archadeck and Baron. Positive comments from friends and neighbors. Wonderful. Thank you for the great job. Baron provided us with the guidance we needed to decide on how we wanted to improve our deck and provide for some shade. His crew delivered exactly what was promised. They were courteous and respected our yard and privacy. There were no additional charges…the exact price we agreed to. We could not be more pleased with the outcome….truly a professional. Archadeck was very helpful in designing our new outdoor space, and were very easy to work with. We are very pleased. The paver patio and TimberTech deck turned out beautifully. 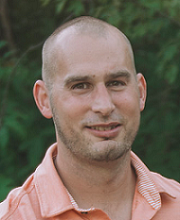 Baron was professional and a pleasure to work with-he was attentive to our needs. The finished product was exactly what we planned and expected. We have enjoyed our new outdoor living space and we would strongly recommend Archadeck to others. We love our new deck, porch and patio. Besides being absolutely beautiful, it is built with the best products. We call it our forever deck/dock. Baron took great care of us to make sure that everything was perfect. High quality workmanship! Great planning for the project and it turned out just like they said it would. Great planning for the project. All phases were professional. The professionalism, the way the crew cleaned up each night, the quality of materials and the quality of workmanship are all reasons we lover our deck and why we would recommend Archadeck. The quality of the work was outstanding and the crew went about their work in a professional manner, and cleaned up the work site every night. A great company to work with. The work was professionally and structurally well done. We love our new porch. We enjoyed working with Mr. Biedenweg. We really like the finished product and are enjoying our new deck. There were a few bumps getting there, but overall we are happy with the product and the workmanship. Good follow-up. Baron provided detailed layouts for our new deck. The drawings were easy to interpret and the 3D helped a lot. The crew was very professional and constructed our new composite deck in a week. The cost was higher than I wanted to go, but it is beautiful and it low maintenance, so we are very pleased with the finished product and the experience. Baron provided just the right amount of leadership and guidance though the design process. The crew cleaned up every night. The warranties are great. Double checking of work and the punch list all speak to thoroughness and wanting to make sure we were satisfied. Multiple check-ins along the way to make sure we were happy and informed. The best building experience we have had! I recommend them HIGHLY. They were honest, dependable, ON TIME, and absolutely professional. We would use them again (and again) – and probably will! 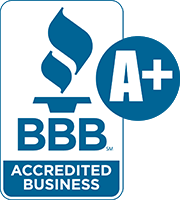 This company was excellent to work with. They kept is up to date and all times an did excellent work and finished our deck on time. Great ideas and workmanship! Good fit with our lake cottage! I appreciate the follow up each year when springtime rolls around. You always check my roll up screens to be sure all is working correctly. Have recommended your services and will continue to do so. Love the pergola and paver patio. Really appreciated the detailed drawings and the opportunity to review and make minor changes. Everything built exactly as planned. Contractors were professional, on time, great work. Thanks to Barron for the project oversight. I moved out of state in June 2015; plan to contact Archadeck for possible work on my new home in Ohio. thanks! The owner showed up on the work site daily and addressed any concern I had. He made sure everyone went the extra mile to make me happy. Baron and his team did an outstanding job in every respect! Baron and team at Arckadeck of Northeast Indiana did a fabulous job from consultative planning through on-time completion. We are completely satisfied with the remarkable transformation of the railing system on our house. They’re very professional and committed to quality and craftsmanship. Proud to be affiliated with them. Our deck has been the summer focal point of the neighborhood since construction. Using benches as the border instead of fencing was particularly effective; this is a patio deck, so it makes the whole area more open and it provides extra seating which, believe it or not, is used quite frequently.